The first major arc of Clone Wars‘ final season is yet another dark, bittersweet, yet ultimately uplifting tale that handles war with remarkable maturity for a so-called children’s series. How many series targeted for a family audience would handle as complex a concept as there often only being a very narrow divide between a patriot and a terrorist, and that that definition is ultimately assigned by the victors who write the history? This story revolves around Onderon, a planet that has fallen under Separatist control but whose king had, before being deposed by the new Separatist leader, refused to choose a side. Neither the Republic nor the Jedi, therefore, can officially fight to protect them, because they aren’t part of the Republic. There is a small, dedicated band of rebels on the planet, however, who are devoted to freeing their planet from the despotic rule of Sanjay Rash, and their violent actions performed with the goal of freeing their planet are defined as terrorist actions by the new king, but are instead rebellion from their standpoint. One of the most striking, significant, and darkest central ironies of this arc is that the man arguing most strongly for the Jedi to involve themselves in Onderon’s fate–not officially but rather through surreptitiously training and arming these rebels how to fight most effectively (a very pointed reference to the US government secretly funding/arming rebels of various totalitarian governments)–is Anakin Skywalker, the very man who will one day devote the majority of his life to crushing rebellion throughout the galaxy. How ironic for he, of all people, to not only be passionately advocating for helping these rebels fight but for them being rebels, not terrorists, when terrorists is precisely how he will define the members of the Rebel Alliance in the future. The show subtly underlines this dramatic irony again when he later encourages one of the rebels by saying, “Impressive, most impressive,” the exact words he will speak to his son, Luke, as Darth Vader, when judging his lightsaber skills. This episode once again hammers home that things didn’t have to turn out the way that they did. At his heart, Anakin is a good, extremely moral, and caring person, and his impulses are often right. The sad truth is that the very qualities that will shape him into Vader are the very ones that make him such a decent human being at this point in his life, and part of the problem is the Jedi Council. That doesn’t excuse Anakin of his future actions, as they are his bad decisions and no one else’s, but just as it would be wrong to deny his responsibility, so would it be unfair to ignore the mistakes made by the Council that drive him into Chancellor Palpatine’s open arms. And here is a good example of why Anakin will one day decide that the best thing for the galaxy would be for him to rule it and shape it the way he sees fit, because while the rules dictate that the Jedi shouldn’t interfere (ironically, the rebels would have to overthrow Rash first in order to officially join the Republic, which is exactly what they need the Republic’s help for, in the first place), Anakin’s heart tells him that this is wrong–that these are people who are desperately trying to escape the oppression of the very enemy that the Republic has vilified (of course, he doesn’t know that this was actually all orchestrated by his beloved Palpatine) and that, as such, the Republic should come to their aid however they can. Interestingly, Ahsoka comes to agree with Anakin, as well, and both will come to bend the Republic’s rules on the matter in different ways. When the situation is at its most dire, Anakin will go to his old enemy, the pirate, Hondo, in order to buy high-tech weapons for the rebels, as well as to pay him to deliver them to Onderon–which is an excellent solution that is completely admirable in the moment; Obi-Wan, for one, is completely behind it–even as it points to Anakin’s tendency to choose a morally gray path when he feels that there’s no other option. It is important to note, however, at this point that he doesn’t outwardly defy the Republic but actually chooses a solution that works in everyones’ interests. In some ways, Ahsoka defies the rules more directly. She holds herself back as long as she can from stepping in when the rebels try to rescue the old king from being executed, and in one fantastic moment, it almost seems that she won’t have to help. The instant before she joins is precisely when General Tandin raises arms against Rash. The rebel, Saw, who had been captured and tortured by the Separatist droid leader, General Kalani, had been able to convince Tandin to finally turn on the new, false king. This is precisely what she and the Jedi had hoped for–that Onderon’s people would learn how to free themselves. Shortly thereafter, however, they’re nearly overtaken, and Ahsoka does decide that she can’t stand by and watch them get slaughtered, and joins in. Anakin’s Padawan is like her Master in many ways, and when push came to shove, she can’t allow the Jedi code/Republic rules to ironically keep her from saving lives. 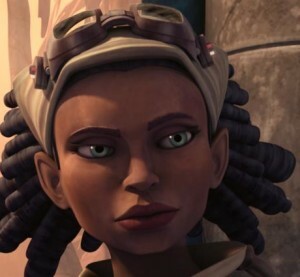 Speaking of Ahsoka, this arc puts her in a very uncomfortable situation, as one of the rebels is her old friend and crush, Lux Bonteri, and he, unfortunately for Ahsoka, has begun to fall for another young woman, Steela Gerrera, a rebel who becomes the leader of the resistance over the course of the story. It’s complicated, because Lux and Ahsoka’s feelings for each other are still very much alive and yet not only have they never directly addressed them but they are–for all intents and purposes–for naught, as Ahsoka is bound by her Jedi status to never act on them, even though her youthful hormones are pushing her in another direction. It is to her credit as a character, as well to the credit of the writers, however, that her slight jealousy of Steela is never allowed to get the better of her. The writing makes it abundantly clear that Lux isn’t her own motive for wanting to help the people of Onderon, and even more importantly, doesn’t factor into her decision to break the rules and help. In fact, her refusal to give in frustrates him on numerous occasions, even while he ultimately respects her philosophy, as she has always respected his. She finally gives in because she can’t let these people suffer, not due to an infatuation. And she doesn’t turn on him when Steela and he share a kiss. Furthermore, the envy goes both ways. Steela isn’t overly thrilled by her presence there at the start, and yet they both come to accept and respect one another. Before Steela’s tragic death, it is Ahoska who is striving most valiantly to save her. Also, significantly, the episodes’ internal friction isn’t only between Ahsoka and Steela (and even there, it’s extremely restrained) but also between Steela and her brother, Saw, who resents not being in charge anymore once she is voted as the new leader, and between Saw and Lux. Saw views Lux as a physically weak politician who should be off somewhere making speeches and has no business fighting alongside them. Even he, however, will come to begrudgingly accept him, especially when he sees that there are things that Lux is better at than he, such as gently tossing the electrical grenades through the droids’ shields. The more forceful Saw and Steela have trouble with that sort of subtlety. The episode also significantly ensures that no one person is completely right. Saw, for example, initially seems wrong in plunging in ahead to rescue the king on his own, and in fact, he gets arrested for it. And yet it is that very arrest that allows him to speak to and reason with Tandin, ultimately convincing him to join the revolution. At the same time, he also accidentally dooms his sister while shooting down the final droid gunship, something for which no one blames him, as they know his sister wouldn’t. And what makes these episodes so powerful is that there is great sacrifice and, due to that sacrifice, huge progress is made. A people who had been oppressed by a corrupt government decide they aren’t going to take it anymore and rise up on their own to retake their world. And, yes, they get a little bit of help, but when push comes to shove, the help only comes in the form of a bit of training, some weaponry, and one Jedi who stayed to fight. The rest is all them. There is, of course, a bit of dramatic irony at the end when Lux finally joins the Republic, since we know how corrupt it is and that it itself will fall in a matter of around a year–the end of the episode seems very deliberately structured to echo the triumphant ceremony at the end of A New Hope, this rebellion successful, Steela’s corpse a dark undertone to this otherwise happy occasion–but for the moment, we can rejoice along with the Onderans about a hard-won peace that they accomplished for themselves and their children.